PLANTATION, FL--(Marketwire - October 13, 2010) - For the second year in a row, DentalPlans.com, the top online source for affordable and easy-to-use alternatives to dental insurance, is proud to donate a portion of the firm's October proceeds to support breast cancer research and awareness. DentalPlans.com is pleased to reaffirm their commitment to women's health and fund groundbreaking research, education, screening and treatment during National Breast Cancer Awareness Month. "As a leader in discount dental plans, our company is fully committed to the well being of our nation's oral health," said Buddy Johnson, CEO of DentalPlans.com, Inc. "We are proud to extend our support to raise public awareness and fund life-saving research to ultimately cure this devastating disease." 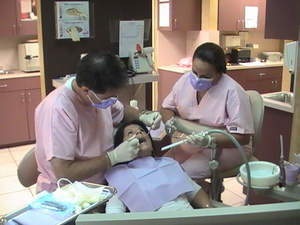 In further support of the company's campaign, DentalPlans.com has provided select network dentists and their staff members with pink dental scrubs and badges inscribed with a pink ribbon and the word 'hope.' "Any small thing we can do to eradicate this disease is a huge step forward," said Dr. Peter Krimsky, who is proudly setting aside the conventional blue scrubs to wear pink ones along with his staff. "We're raising awareness and prompting our patients to think." Dr. Krimsky's office sees wearing pink as making a difference, one that will one day contribute to the end of the disease. Others are adopting the same thinking and pink is popping up where one might least expect. This year, the National Football League has teamed with the American Cancer Society to feature players, coaches and referees wearing pink apparel in the name of awareness. According to the American Cancer Society, breast cancer is the second leading cause of cancer death in women, after lung cancer. One out of eight American women who live to be 85 years of age will develop breast cancer, a risk that was one out of 14 in 1960. Excluding cancers of the skin, breast cancer is the most common cancer diagnosed among U.S. women, accounting for more than 1 in 4 cancers. Interviews with DentalPlans.com representatives, members and network dentists are available. For more information about DentalPlans.com and editorial inquiries, please contact Shamin Abas or Elizabeth Rose of Shamin Abas Public Relations at 561.366.1226, shamin@shaminabaspr.com or elizabeth@shaminabaspr.com. DentalPlans.com is dedicated to improving oral health nationwide by making quality dental care affordable and accessible to everyone. DentalPlans.com proudly offers the freedom to choose from an extensive selection of discount dental plans designed to save members money on their dental care needs. With more than 40 years of experience in the dental industry, their devoted team quickly transformed DentalPlans.com into a trusted industry leader and the largest online provider of discount dental plans. Since 1999, DentalPlans.com has offered great value and convenience with an extensive choice of money-saving discount dental plans in one user-friendly website.